IC 1396 is the most prominent part of the Cepheus bubble. The reddish star towards the top of the nebula in this image is the enormous cool supergiant Mu Cephei. The Cassiopeia arc, the brightest part of the Perseus arm visible from Earth, reaches its westernmost extent with the end of the Cep OB1 association in this sector. Objects continue to appear in the Perseus arm west of the Cassiopeia arc, however, including Sh 2-124 and the giant filamentary HII region CTB 102. 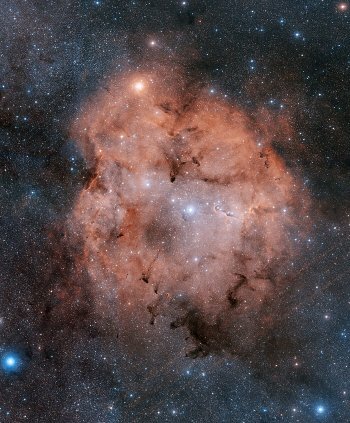 This sector also includes the spectacular Sh 2-131 (IC 1396) and the beginning of the Rift dust clouds. In addition to the "A" component of HD 206267, which is actually a close O6.5V+O9 class binary, the system contains three other dimmer components. .
IC 1396 has no common name, but given the location of the Elephant Trunk nebula, perhaps IC 1396 as a whole could be called the Elephant nebula? 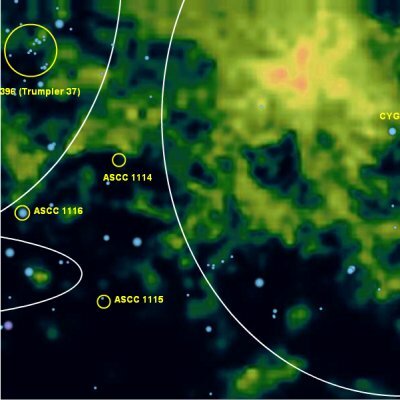 Kharchenko and her colleagues have discovered two new ionising star clusters, ASCC 1114 and ASCC 1115, which respectively lie at distances of 550 parsecs and 600 parsecs, between Cep OB2 and the Cyg OB7 molecular clouds. ASCC 1114 has one B2 class ionising star, DM +53 2683, and is 56.2 million years old. ASCC 1115 also has one B2 class ionising star, DM +50 3496, and is 389 million years old. These ages, especially the age for ASCC 1115, are unusually old for clusters that contain ionising stars. Stars embedded deeply in the Cyg OB7 dust clouds are visible in this microwave image, which also shows the major ionising stars, clusters and associations in this sector. What certainly does exist in this direction is a complex of molecular clouds at a distance of about 800 parsecs that continues the Cepheus clouds seen to the east. By tradition, this complex is called the Cyg OB7 molecular clouds after the OB association that was once believed to lie in this direction. The Cyg OB7 clouds are very dusty. They obscure the sky so effectively in this direction that the central dark nebula [K60] 141 (less formally called Khavtassi 141) is often called the "Northern Coalsack" ,  although this term is also used for several other dark clouds in Cygnus as well. Cyg OB7 begins the complex of local dust clouds that stretch from about 95° to 25° in galactic longitude and obscure large parts of the Milky Way in visual light. This complex is usually called the Rift because it appears to tear the Milky Way asunder. Fortunately, observations in radio, microwave and infrared frequencies make it possible to pierce the Rift clouds and observe what lies beyond. A second prominent radio source some distance to the west of SNR G093.7-00.3, 3CR 431 (NRAO 654), is well studied, with references in at least 35 scientific papers. None of these papers appear to suggest what it is, however. The enormous filamentary HII region CTB 102, a major component of the Perseus arm, is visible at radio frequencies behind the Cyg OB7 dust clouds. This image also shows the major HII regions and supernova remnants in this sector. A radio map of Sh 2-120 shows a shell-like structure around a central source. Very little information is available in the literature apart from this map. 3. ^ Weikard, H., Wouterloot, J. G. A., Castets, A., Winnewisser, G., & Sugitani, K. 1996, Astronomy and Astrophysics, The structure of the IC1396 region. 4. ^ Schulz, N. S., Berghoefer, T. W., & Zinnecker, H. 1997, Astronomy and Astrophysics, The X-ray view of the central part of IC 1396. 20. ^ Humphreys, R. M. 1978, Astrophysical Journal Supplement Series, Studies of luminous stars in nearby galaxies. I. Supergiants and O stars in the Milky Way. and the unpublished catalogs available here. 27. 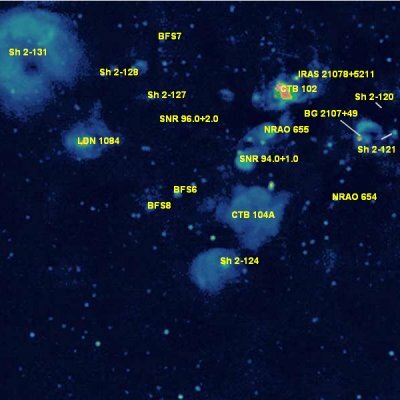 ^ Anandarao, B. G., Venkataraman, V., Ghosh, S. K., Ojha, D. K., & Vig, S. 2005, Bulletin of the Astronomical Society of India, Near-infrared photometry and radio continuum observations of the massive star-forming region IRAS 21413+5442.